Size( Length X Width X Height): 48" x 48"
Power: 120VAC 2 Mtrs. 240VAC 2 Mtrs. We also manufacturer bulk container. Plastic Intermediate Bulk Container - 1000 Litrs with Metal Cage & Metal Pallet. FLEXITANK is special equipment for transportation bulk Non-Hazardous Chemicals and Food ingredients cargoes, using the standard 20-foot sea or railway container. 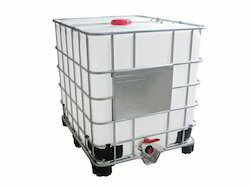 In response to a move by pharmaceutical manufacturers towards operating with discrete batches, Buck Systems has developed a comprehensive and high quality range of Intermediate Bulk Containers (IBC Systems) for contained materials handling, processing, storage, tumble blending and transport of pharmaceutical products. The company's Flexible Intermediate Bulk Containers (FIBC) Big Bags are the ideal solution for packaging, storage and transport of bulk goods in powder, granular and semi liquid form. The entire Big Bags range is very diverse with special versions available besides various basic types. We are one of the renowned firm for providing several kinds of supreme quality Bulk Containers in the market. These products are manufactured using quality tested raw materials. With the assistance of advanced tools and modern methods, we offer an exceptional array of Intermediate Bulk Containers. Our entire product range is durable in nature and is spacious. We offer them with varied capacities and are delivered in standard dimensions.